The Benefits Of Roller Conveyors In Business | MB Magazine UK | Discover the latest in technology, reviews, guides & features. In an age when there is an emphasis on using sustainable resources, particularly in industry and commerce, roller conveyor systems have been at the forefront of this type of technology for many years. They offer cost effective flexibility across a range of businesses as diverse as fast food outlets and the transportation of goods within a workspace. A roller conveyor system comprises long connecting trays filled with tubes that move objects placed upon them simply by rotating under the natural force of gravity and require no power to operate them, offering the perfect green solution compared to a powered system. The trays are manufactured as open ended modules that can be fitted together to create lengths of any distance to suit the requirements of the workplace. Completely adaptable and customisable, the modules can be curved to negotiate corners. 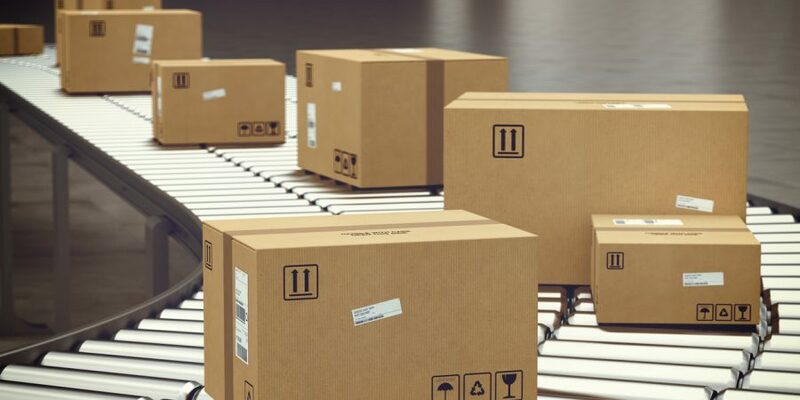 Sections can be added or removed and the conveyor system itself can be arranged horizontally or on an incline to account for sending packages from one height level to another. The rollers are hollow tubes, usually made of stainless steel but can also be made of a high impact plastic. Bearings are at each end of the tubes and enable the smooth turning of the rollers. The system requires very little maintenance. If a roller should every need replacing it is simply pushed sideways before pulled from its location and a new one inserted in its place. A minimum amount of time is needed for such a repair, causing little or no interruption to productivity. The roller conveyor system is perfect for moving objects of all sizes and weights and is invaluable in the swift movement of packaged goods in warehouses. Cardboard boxes for instance need the slightest of pushes to start the rollers into action, then gravity, the force of two separate bodies gravitating towards each other, takes over to move the package from one location to another, coming to a stop at the appropriate place by a fixed objective or section without rollers. The primary use of a roller conveyor system is in the movement of goods across warehouses, but it is also used to move small cartons in fast food outlets and to move luggage at airports where delays would be considerably longer without the system. Roller conveyors make operations such as these quick and efficient saving time, energy and the need for a large workforce. Moving goods in this way also benefits the workers as they do not have to manually carry packages across long distances. Roller conveyor systems are flexible, adaptable and totally customisable. The system is very cost effective to install and as a long term investment, it can be adapted to different lengths and can even be dismantled and moved relatively easily. It can also be incorporated into a similar skate roller system that uses rows of small wheels instead of tubes, but does require a small amount of energy to power it. Movement of packaged goods by using a gravity roller conveyor is simple, fast and reliable and with no power involved and virtually no maintenance required, reduces industry’s carbon footprint considerably.